Wrath of the Righteous is the third boxed set in the Pathfinder Adventure Card Game series, and with the announcement of Hell's Vengeance a few weeks back for the Pathfinder Role Playing Game I don't see any sign of it stopping. If you've played a Pathfinder Adventure Card Game before, either Rise of the Runelords or Skulls and Shackles, then you'll know what to expect here. Wrath of the Righteous offers some new mechanics into the mix, but doesn't shake up the concept too much, it's the campaign based deck building game you're already used to. We'll go through these new mechanics a little later but if you have already played and enjoyed the two previous boxed sets then you should just go out and buy Wrath of the Righteous. I should probably start this review by stating that I am not a World War 2 nut, I really couldn’t tell you the difference between a Sherman and a Tiger and put a Spitfire and a Hurricane in front of me and I couldn’t tell you which one is which. However, there are people in this world who are, and I can tell you that Fog and Friction has been designed for those people. 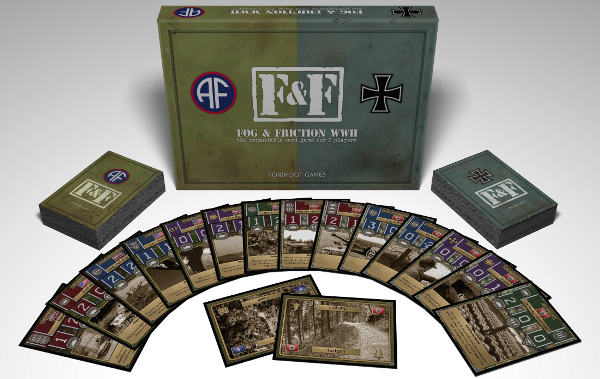 The reason I know this is because I played Fog and Friction with one of these WWII aficionados and he was very pleased with the historical accuracy. I’m now going to ruin that sentiment by saying that Fog & Friction plays a lot like Warhammer 40,000 Conquest. Are you a storyteller, a yarn spinner, a master of dungeons? Do you create worlds, forge landscapes or sculpt characters? Have you ever peered over the top of your Game Master's screen and thought "this needs to go wider than this paltry group of adventurers"? 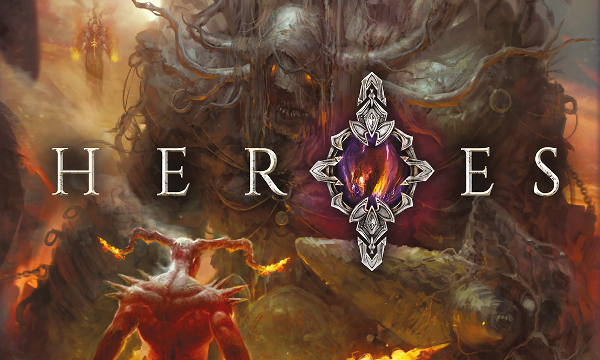 If so then Liber Primus Games, wants to speak to you about their latest series of game books. Who ate all the pies? Who ate all the pies? You fat Halfling you fat Halfling, you ate all the pies! 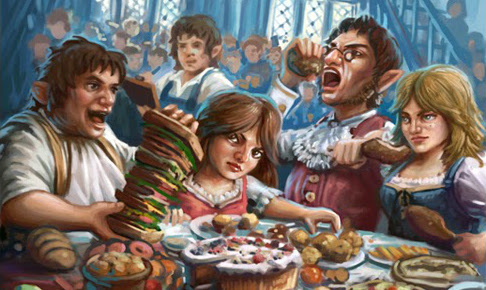 Which in Halfling Feast is actually a good thing, because the aim of the game is to cram as much food down your face hole as possible. Halfling Feast is a game about a hairy footed eating contest, you have to scoff the most dishes without getting full and avoiding your opponents' sneaky tricks. It's an unbelievably simple game to play and goes faster than a tray of hot cakes due to its limited ‘take one action per turn’ aspect of the game. 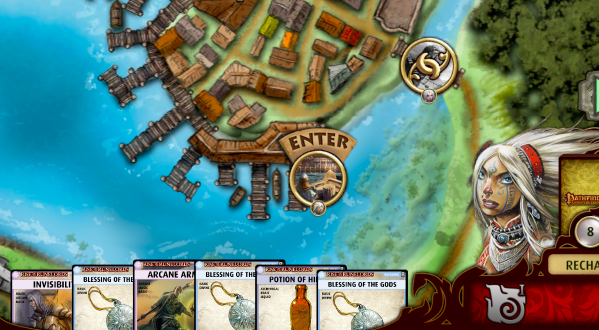 Did you know that Obsidian Entertainment, the people behind games like Knights of the Old Republic 2, Fallout New Vegas and South Park the Stick of Truth, are making a digital version of Pathfinder the Adventure Card Game? Well there are and we have some tasty screenshots of the upcoming game. Armello is a new breed of game, a video game that takes everything we like about physical board games and transcribes them into a virtual world, too complex for mere mortals to handle on the table top. At least that’s the theory. This isn’t a videogame port of your favourite board game, no this is a board game that’s been designed from the ground up to be played on a PC or tablet. It certainly looks beautiful but can this young upstart stand up against its cardboard cousins. Like an anthropomorphised Game of Thrones, Armello is all about different factions vying to seize control over a corrupted King, who is slowly being killed by the dark Rot that is infesting him. The corruption leads to multiple paths to victory; kill the king, gain enough prestige to succeed the throne should the King die of his ailment or cure him of his blighted infestation.